This post was originally posted by my friend Sergey Anashkevich. All the pictures are made by him. Thousands of tourists visit ruins of ancient greek town Khersones in Sevastol every year. Photographs of its views: the church, coloumns, the bell could be found on hundreds of post-cards and souvineers. 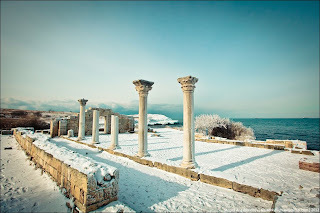 But just few have seen the town under the snow, which is rare in Taurica (Crimea).